Elvis was known as the King of Rock n Roll. He was part of a movement that changed the history of music forever. He and a number of other performers introduced a new way for teenagers to dance and have fun. Elvis basked in the spotlight with glitz and glamour, wearing his famous jumpsuits that are fit only for a king. 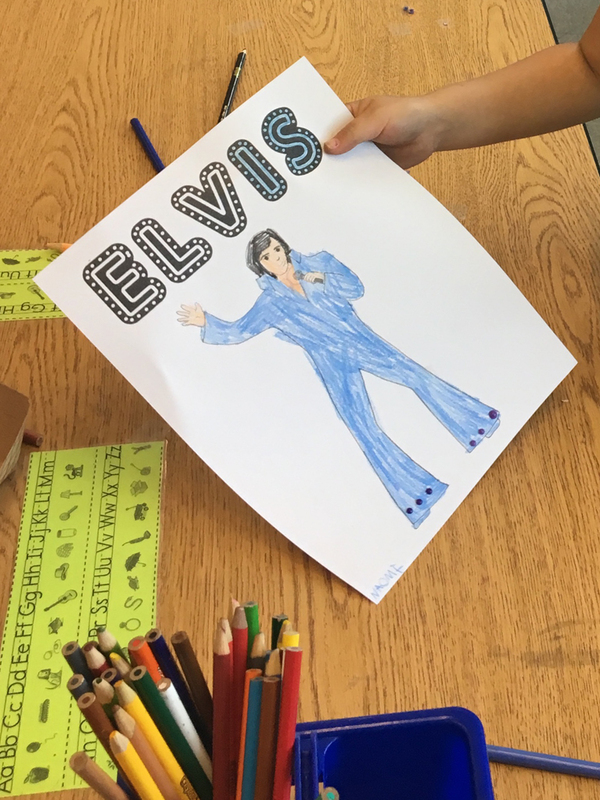 Here, we embellished a photocopy of a drawing of Elvis with stick-on gems from the dollar bin at the craft store. 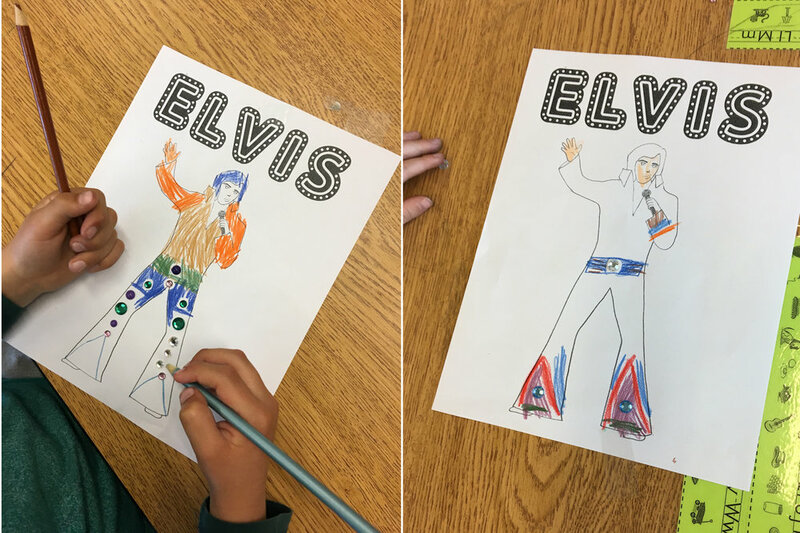 I love how my students emphasized the bell-bottoms and some gave him "sunglasses." To add more glam to his suit, we used Crayola metallic colored pencils in addition to regular ones. Don't forget to make the belt real big! An absolute favorite book that I refer to a whole bunch is Mid-Century Modern Women in the Visual Arts by Ellen Surrey. Not only does it include women who found success in the 1950s and 1960s, but it's diverse and isn't limited to just 2D art. The illustrations are incredible! I turned to this book to introduce my students to Alma Thomas, a painter whose work is very mosaic-like. We love her bright colors and her patterns. Small pre-cut squares (ok if they're imperfect) about 1"
Start in the middle of the paper with one square. Make it a nice one, since it will be the focal point of the piece. Glue it down and then glue more squares around it. Then glue more squares around those ones, continuing until the paper is filled with wonderful, colorful squares.